Oil on canvas, 35 ½ x 51 ½ in. Peters is rare among early California painters in that he was actually born in the state and trained here. (Later he studied art in Europe.) 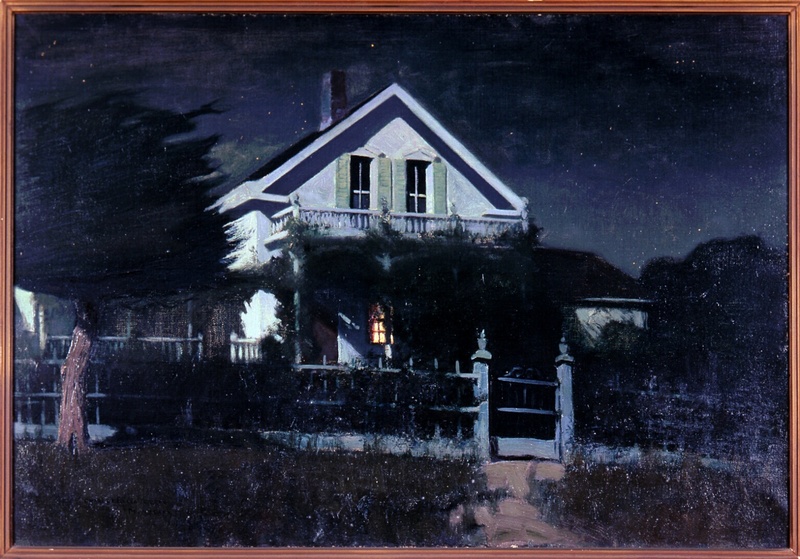 He is also unique in his focus on painting nocturnes (night scenes), a genre that was made popular by American expatriate painter James Abbott McNeill Whistler in the second half of the nineteenth century. In his early career his subjects were varied, including Untitled, which represents his own home in Monterey and was painted the year he married. It ranks as a masterpiece being both physically large and depicting a complicated Victorian structure. It stands out from what was to soon become his mainstay -- smaller views of adobe hovels with a light burning in the window.